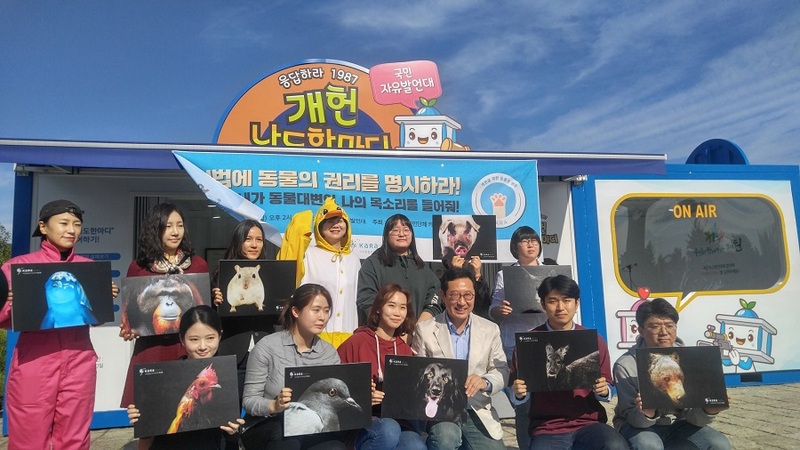 Korean news Hankyoreh reported on March 20, 2018, that if the new Constitution to be proposed by President Moon Jaein passes, provisions for a national policy on animal protection will be established. 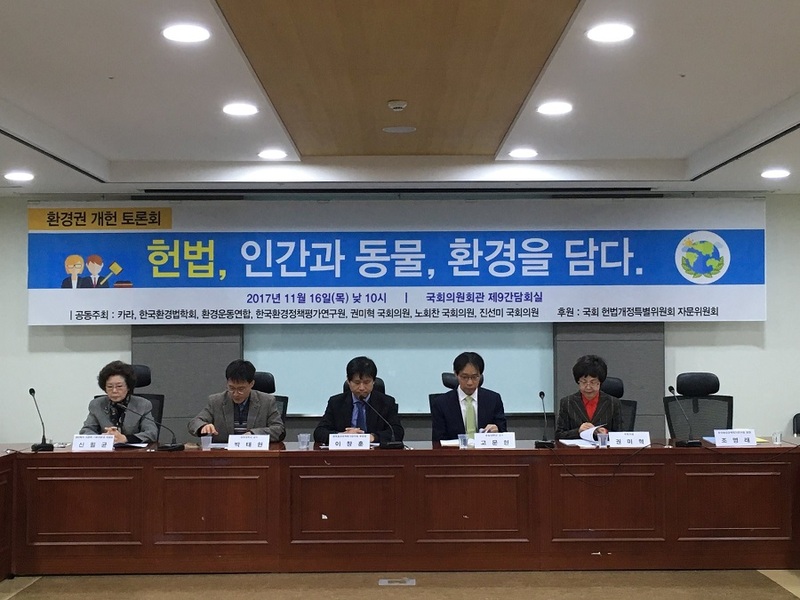 On March 20th, Cheongwadae (Blue House, the presidential residence) announced part of the bill for a Constitutional amendment, stating that they have created provisions to establish a national policy on animal protection as well as stipulating a right to life to animals. The details were not disclosed, but according to Cheongwadae officials it is absolutely certain that provisions for animal protection are included. If the Constitution stipulates animal protection as the nation’s responsibility, changes in lower level legislation can also be expected. Under the current civil law, humans and objects are defined; animals are considered objects, a possession by humans. However, the proposed constitution will specify humans, animals, and objects separately. KARA stated that one disappointment is, that despite these progressive developments, the proposed amendment still falls short of acknowledging animals as “living organisms with the right not to be subject to suffering or unjust treatment”. KARA also stated that it is up to the National Assembly to decide whether to vote on the constitutional amendment in June; unfortunately, there is currently no consensus in the national assembly on the amendment provisions. KARA stated that if Cheongwadae is as persuasive with the assembly about the necessity of this amendment as they have shown us they can be, and actively directs the process, we are hopeful the amendment will pass. Click HERE to learn more from KARA’s post. Switzerland, Germany, and Ecuador are the countries that have defined animal protection. Switzerland has stipulated in their Constitution the dignity of life for all animals, and Germany has also included animal protection provisions in their Constitution. Ecuador goes one step further and gives rights to nature as well. Click “Take Action” below add your voice to the petitions organized by the Korean animal rights activists campaigning for the amendment of constitution. Photos: Constitution Amendment on Environment Panel Discussion on November 16, 2017 “ Inclusion of Human, Animal, Nature to the Constitution”. KARA. This can not happen soon enough! These poor animals Dogs and Cats deserve a better life, free from misery, torture, neglect, pain, and suffering The animals deserve decent humane care, good food and fresh water, clean kennel space and protection from the elements. They deserve Love and Kind Treatment and to live their lives in peace and safety. Please End The Dog and Cat Meat Trade as soon as possible, for the sake of Dogs and Cats. They deserve to live their lives Free From Torture, and Free From Suffering. Please, be sure that they make the right paragraphs and New lows, that Protect animals rights. So happy to hear the good news. This is indeed a positive beginning for the proud people of South Korea. Thank you for sparing the beautiful animals of your country. Thank you for caring. This is amazing news. I’m afraid to get my hopes up. Will keep praying. I hope this passes. The animals deserve not to be mistreated. If this passes, people all over the world will think much better of South Korea. Does this also mean they will NOT be torturing and eating CATS and DOGS??!!! And that ALL providences will KNOW the NEW LAWS??!! So that those who WILL still torture and eat these fur babies will be held accountable and jailed???!!!!! I hope and pray that the dog meat trade will end. My heartfelt thanks to all the activists working tirelessly to stop it. Please President Moon Jae In let the world see a compassionate South Korea. Protect God’s creations. Animal suffer the same as long as humans, they cry, look for mom, feel pain, desire rispect. PLEASE GOD THIS NIGHTMARE WILL END NOW !